The name supposedly came from an unknown sailor who saw fire spitting out of the volcano, which this island is, and named it "The Devil's Island" or "Santorini." It's also written that the local inhabitants worshipped Saint Irene, and Santorini is a variation on that theme. The island cluster is also known as Thira (Phira, Fira), which is also the name of the largest, and central, community. Thira was the first Spartan king to arrive on the island. There are several islands within the grouping known as Santorini; only one is inhabited. The area lies 220 km south of Athens (128 nautical miles south of the port of Piraeus) in the Cyclades Islands, and is, in fact, the southernmost of those small islands, with the exception of the much larger island of Crete, which is a bit further south. All of these islands are Greek. This volcanic island was formed 800,000 years ago. The original islands were situated atop a fault in the earth's crust, and the sliding of those plates caused a major eruption in 1628 B.C.E. Apparently the eruption created a huge lava dome, which sunk from its own weight, creating a 366 meter (1,200') deep crater, and left 188 meter (600') high jagged cliffs on which communities have been built. The significance of the above is that the ensuing tidal waves might have swamped the navies of Crete and/or flooded coastal cities. There is neither proof nor consensus of what really happened to Crete, but a once wonderfully advanced civilization simply stopped existing at about the time of the eruption. Volcanic ash did bury major habitations on that island (Crete), which actually led the archaeologist Prof. Spyridon Marinatos to come here to Santorini and excavate Akrotiri, commencing in 1967. Refer to "Crete" for further information. See "Akrotiri" below for information on the surviving 4000 year-old settlement on the southern tip of the island. 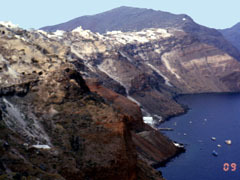 The caldera, or crater, of Santorini, filled with waters of the Aegean, measures 7.5 by 11 kilometers (4.7 by 6.8 miles). The sprinkles of white on top of the rim of the crater are houses, shops, churches, and schools. The base has several landing spots and small ports.